This holiday season, men want to look their best. Whether spending the holiday with that special someone, meeting the girlfriends parents for the first time, or taking family home for the holidays, men want to be confident that their appearance won't be what everyone remembers after New Years. Here are a few grooming tips to help men look their best. While this may sound simplistic, a basic haircut can improve a man's overall look dramatically. However, depending on where you live you may want to have the barber not take as much off the top to help keep your head warm. Also, think about doing something with those sideburns. Some guys look great with sideburns and others look like bad impersonation of Elvis. If you want Elvis, go watch an impersonator the next time you play slots in Vegas. Even if it is just shortening them up a bit or thinning them out, make the sideburns look a little more presentable. Unless you are planning on spending the holidays alone with someone that loves the scruffy look, lose it. When showing off to the family over the holidays, there is no need to look like you just got in from a two week mountain excursion. If you normally wear a bears, mustache, or goatee, trim it up. The Braun beard and mustache trimmer is a great tool for this. Something that many guys overlook are their nails. Take a look at them. If they can be used as a makeshift backscratcher, then it is time to trim them down. Also, if your nails are anything other than white, clean them. Don't forget your toe nails. Two things you don't need. The first is the dagger toenail that pokes holes through your socks. The next are the discolored nails (due to lack of care) that make people wonder if there is something wrong with your feet. Any guy over 30 knows what I am talking about. You go to shave or trim your mustache and you have stray hairs hanging out of your nose. Be sure to check these before you leave for the holidays. Trust me, if you don't trim them now, they will find a way to make themselves noticed at the dinner table. Casinoguide.com and other sites put a lot more emphasis on male grooming and outfits around the holiday for a simple fact. As guys, we tend to overlook or not care about the small stuff. Remember, while we might not care, others will. The holidays are a time to look and feel your best. Take a few extra minutes on grooming before you head out to make the holidays better for all. MuLondon is based in London,UK and they specialize in producing fabulous natural and organic stuff for your skin, body and home. Their products are made by hand from pure, natural and, where possible, certified organic ingredients. MuLondon products contain no artificial preservatives, emulsifiers or fragrances. Instead, pure natural essential oils and herbal extracts are used to divinely scent and gently preserve. MuLondon's most popular line of products is hand, face and body moisturisers based on pure and Soil Association organic certified shea butter. Check their site for more info MuLondon. Been Around the World and Back! Traveling on an airplane is the fastest way to reach your destination, be it an holiday resort or a business trip. New security procedures can slow down boarding operations. Speed up your way to check in: 50ml BEAUTY ON BOARD is a new beauty travel kit built to get you through security check in a mere second. In Milan Simone Russo art concept and Antonio Conti experience in cosmetics teamed up to create the ultimate travel kit that contains just the right amount of products for body and hair. Four singular packs in a folding envelope with a round cut-as-a-handle to hang it in the shower. Body shower shampoo, Hand care, Shaving gel and After Shave have never been so cool and quick! When in Italy you can find 50ml BEAUTY ON BOARD in Linate and Malpensa Milan airports, High Tech and Cargo concept stores in Milan. 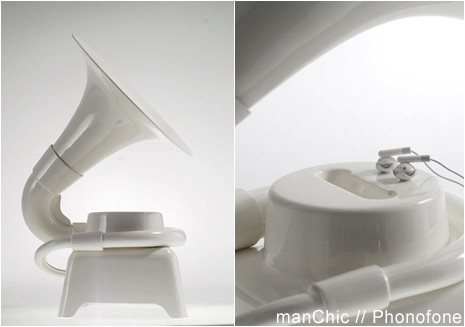 Could it be a wonderful justification for your trip to Milan during the male fashion shows? A unique non-foaming shaving gel formula designed for use on dry rather than wet skin. No water, no foam, no mess - Just wet the razor! And for the sensitive kinds ;-) they also have a great post shave Aloe Vera moisturizing. Relief and helps protect skin from dryness, alcohol-free, oil free, and will not clog your pores. Coming soon gents a daily scrub with micro beads that will help cleanse and smooth skin.Bold was among the coveted giveaways in the Celebrity Gift Bag at the 79th Academy Awards celebration party. The Philips Norelco Bodygroom is the all-in-one grooming solution, exclusively for men, that safely trims and shaves all body zones. 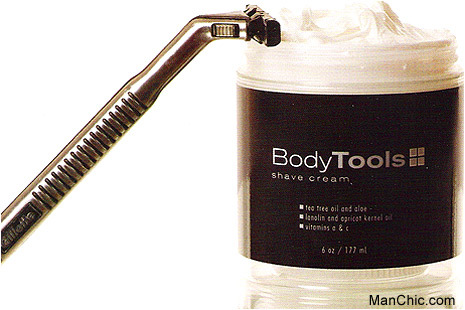 With the Bodygroom, men can trim and shave hair from their chest & abs, underarms, groin area, legs, back and shoulders. We did get the chance to test it and have been using it since. It is the best thing outthere for body grooming. LifeLab facial skincares, with a single action, and a single application can replace numerous products normally on offer for men such as after-shave, anti-wrinkle creams, moisturiser, cream for dark circles and eye bags, refreshing and toning products. Tried it , Loved it. Changing shave creams usually leads to big disappointment; so you end up running back to your old products... maybe Gillette is the best man can get. Enter merchandising guru Al Wines, Jr. and Dr. Steven May with Body Tools, a line of products designed to add "skin care" to "nutrition" and "fitness" as the keys to "anti-aging", and healthy living. The shave Cream with Tea Tree and Aloe is the smoothest, most balanced, knick-reducing cream we've found on the market. The line is comprised of everything you need for hair, body, and face care. Just think, this could be the last time you ever switch shaving creams...ever. 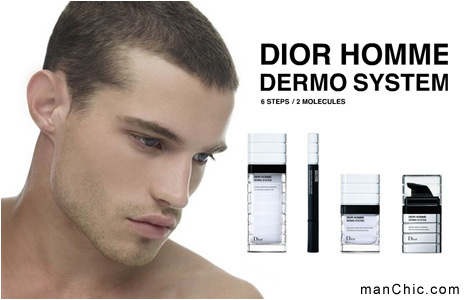 The system, by Hedi Slimane, called Dermo system, consists of four products: a hydrating toner, serum, moisturizer and an eye cream dispensed directly on the skin via an applicator resembling a click pen. Retail prices are $51 for eye serum, $62 for 100 ml of toner or 50 ml of moisturizer, or $96 for 50 ml serum. 20-year-old American model named Ambrose was photographed by Slimane himself.